Hi, i want to begin the 2017 season of Bandaids Bookclub with a new book. 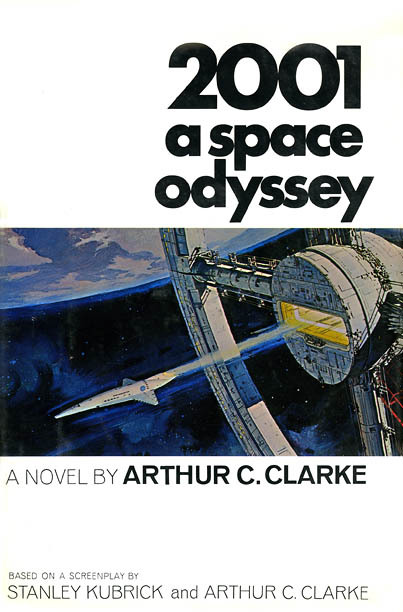 2001: a space oddysey (1968) is a science fiction novel by Arthur C. Clarke. In the background of the story an ancient and unseen alien race uses a device with the appearance of a large crystalline monolith to investigate worlds all across the galaxy and, if possible, to encourage the development of intelligent life. The novel was developed concurrently with Stanley Kubrick's film version and published after the release of the film. Clarke and Kubrick worked on the book together, but eventually only Clarke ended up as the official author. So we can talk about the movie too. The novel has sold millions of copies and is a reference for subsequent sci-fi writers and readers. Also the movie is a classic. 2010: Odyssey Two (1982). With movie in 1984. 3001: The Final Odyssey (1997). The book is highly available on the internet, you can have it doing a web search and typing: "2001 a space odyssey book pdf" or similar words. And clicking on a page with the pdf or epub, doc, etc. Downloaded it onto my kindle. Looking forward to reading this, I haven't seen the film so it'll be totally new to me. In this are attached the versions of the book for spanish speakers to read too. Thanks for the like @harvey. I started reading this a couple of days ago. I don't have much free time to read due to my dissertation but will post some thoughts as soon as I can. I'm finishing some books before i start with this. Some by Olaf Stapledon, A room of one's own by Virginia Woolf, and others. Maybe i start this by february, but i don't know. Anyone more are going to read this book? Haha no worries, I can hold back reading until you start it if you like? I'm reading two other books atm as well, A Brief History of Time by Stephen Hawking and A Little Life by Hanya Yanagihara. Do let me know what you think of A Room Of One's Own, I've been wanting to read it for a while. A Brief History of Time. I saw your image in instagram. I really like science and space, and philosophy. But i only read a few of non fiction. When i finish A Room of one's own i will tell you. I'm in. Going to read Space Odyssey 2001 with the rest of you!! Haven't seen the film either, most of it anyway. I will stop reading other books then. I will start tonight reading 2001. I'm on chapter 10, small chapters, good read so far. I daresay it's better than the film from what I remember of the film... Talk of aliens in a private conference. COOL! On Chapter 29. I hope everybody else is making good progress with this book! I think ezzz is busy with university. Or something. After handing in my dissertation yesterday I have some more free time. I'll be able to read some more of this book tonight. Also, I'm not sure what editions you guys are reading but the one I have has a Foreword written but Clarke. It was really interesting, I had no idea that the book was written in conjunction with the film, I always assumed that the book came first.